The Bruins! Stanley Cup! Game 7! Puck drop is less than an hour away for the Game 7 Stanley Cup run for the Bruins. Amazing. I knew the Bruins were doing well at the beginning of the season but they fell of in the second half and I wasn’t sure they were going to do much in the playoffs. And yet here we are. Damn, this is exciting. Again, I gotta guess with my heart and say the Bruins by 2 goals. But like I wrote about Game 6, the Bruins play an emotional game and there’s a lot of potential swing. I think we need an early goal. Preferably within the first 10 minutes and before Vancouver scores at all. Oh, and if it happens to be a shorty by Marchand that hits the water bottle, all the better!! At this point, live blogging seems like a fun idea. I may bail on it if the game turns depressing. Or if things go really well and I’m too jacked to type. Go Bruins!! I like Horton squirting the Boston water on the ice in front of the Boston bench. Why do the Canadians always rush through the USA national anthem? Okay, I know it isn’t theirs but geez, a little respect, huh? I have always wondered about the Cup and the names engraved on it. I have always figured that if they really did keep engraving all the names, surely they would need to add more space. And that would make the cup get bigger and bigger such that the classic move with it over the head would be more and more difficult. Turns out that they had filled up the cup a few years ago and they removed the top “band” and that is retired in the hall of fame and a blank band was added at the bottom. Cool, that answers my question and it is a sustainable plan. It was in the paint! That was close. Yay! Not a shorty, not Marchand, and 5 minutes more than my 10 minute preference, but it’ll do! There’s Marchand’s goal! Woo hoo! And there’s the shorty! I’m having fun! Hope you are too. Ever wonder about the guy with all the hair that spends an inordinate amount of time polishing the cup as though it were Aladdin’s lamp? Read about Phil Pritchard here and here. And now Marchand gets an EN too. A rookie with two in a Game 7 Cup final. How much better can it get for that kid. The game is an hour away and I’m getting nervous. Yes, the Bruins have faced elimination already in the playoffs, but something about getting to where they are and playing as well as they did in the games that they lost, I’m more invested in the win than I would be normally. Who’s going to win? Well, the statistics would indicate that Boston will win because of how well they’ve done on home ice in the series (and the playoffs as a whole) so far. On the other hand, Boston seems to be a team that plays more by emotion than by the numbers and if I’m them, I feeling like the odds are against two wins, including one in Vancouver – that may be hard to get out of their heads. On the other hand, maybe it’s more about the emotion that they win or they watch somebody else hoist the cup tonight. So, from where I sit right now, I’m going to have to guess with my heart and say the Bruins will win tonight. But not by much. Writing this didn’t do my nerves any favors. 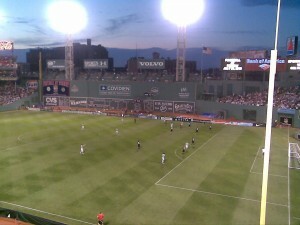 With the World Cup only recently having concluded, how could I pass up a chance to see some international soccer right here at Fenway Park!? 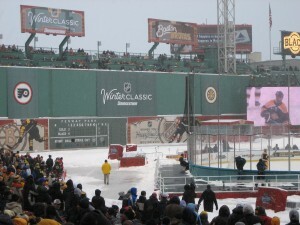 Celtic FC and Sporting Clube De Portugal played in a slightly smaller field stretched across the Fenway grass from visitor’s dugout to the bullpen (see picture below). It turned out to be a good game which was a nice surprise, especially after some lame World Cup games – open play, good scoring chances from one side were answered with good scoring changes from the other. Some of the chippy play and diving did work it’s way into the game, particularly in the form of play from Celtic’s striker Georgios Samaras who was ball handling in the box and drew a foul to get a PK. He didn’t even still have possession of the ball at the time he was “tripped” by a defender standing still that Samaras ran into but he made it look good and that put Celtic up 1-nil. Sporting’s goal was pretty, though, and that made me want them to win. The game ended in a 1-1 tie. The announcer said “In accordance with FIFA Rules Of The Game, the final recorded score will be a 1 to 1 tie game. Penalty kicks will only be used to determine the winner.”. Classic FIFA statement! Anyway, the PKs went 6 to 5 Celtic’s way. But it was a fun game and I’m glad I got to see it. The announcer said they had over 32,000 people. That’s not quite a sellout, but within a few thousand of a sellout. I’d love to see them repeat this kind of event every summer with different teams. It must be easier to setup for soccer than for hockey, at least!! In tenpin, there are between 40 and 50 thousand perfect games bowled each year. Four different times, a perfect tenpin game has been bowled by someone who is legally blind. By contrast, the average score for an elite candlepin bowler is 130 out of 300 with an all-time high of 245. Isn’t a game more fun when people don’t routinely achieve perfection and where the game is more about how well you can do rather than merely reducing the number of times you screw up the perfect game? Every four years I tune in to see the beautiful game played on the national scale and every four years I’m let down by the current state of international soccer. There is some fantastic skill level but the inability for some of these national teams to coalesce into a unified force is disappointing (I’m looking at you, England!). I think what is even more depressing is the extent to which fouls impact the game. Maybe I’m to naive to remember but it seems to me that fouls are having more of an impact than they used to. And the players (and presumably the coaches) are using that to game the system. That translates into lots of embellishments and dives which detract from the game. It’s hard to explain to my friends who don’t get soccer why they should watch when any given 10 minute stretch has a couple of fouls where a player goes down with a look on his face indicating he is near death only to be revived with a few hits of the magic cold spray. The biggest offenders of the faking were the Netherlands and in particular Arjen Robben. The so-called “Glassman” (due to how easily he is broken) is a skilled player – he doesn’t need to and shouldn’t resort to the theatrics. And I’m quite happy that Netherlands didn’t win the final because we certainly don’t want to reward that nonsense. Spain deserved to win the final and I’m glad that they did. The standout player of the whole Cup was Diego Forlan of Uruguay. Team Uruguay did well to get to the 3rd place game but I don’t think you could say that they would have gotten there if it weren’t for Forlan. His ability to put the ball where he wants it is a skill that too infrequent in today’s game. It’s great to watch him because you feel like there’s less “kick it and see what happens” to his game. One more complaint about the Cup before I wait another 4 years to whine again: we need more goals. No, I’m not saying that so we get more American viewers (all that would sure help interest). But I think more goals would better ensure that the better teams go on in the tournament and cut down on the number of fluke wins. Spain had so many games that were 1-nil and even though they did win and I think they were the best, they were close being knocked out a number of times. I know that it doesn’t make my case that the best team did win but the fact that they were close to not winning is the key. If anyone has suggestions for how to get more goals scored, I’d love to hear it. The only one I have is to substantially alter or remove off-sides altogether. Happy to see Chicago win the cup. Nice to see the team that played a better game through the playoffs be the one to win it all. Big points to Philly for being behind the whole way through the playoffs and somehow being able to win when they needed to. But you don’t have to look much further than Hartnell’s goal where he got the puck in the net and after briefly getting his arms in the air, he put them back down to check a Chicago player into the net to follow the puck! After his goal! It was funny to see – like he was compelled to be a thug even though he had just proved he didn’t need to be. The Bruins game last night was the best of the season. And I don’t just mean because the game was exciting to watch, which it was. But the effort put in by the Bruins was top notch and they had good puck movement. Passes that ordinarily would have been sloppy and miss their targets connected solidly. Sobotka was the star of the game, IMO – not quite a Gordie Howe hat trick, but close. His little plays like knowing to drop to the trailing player instead of going for the obvious cross-ice pass are what made the game a success. Even Wideman had a good game and I’ve been critical of him recently. Lucic seemed like the only one who was not playing to potential; he coughed up the puck in his own end due to sloppy puck handling and he was overly emotional; granted, Looch is known for the emotion but sometimes he knows how to turn the passion to smart hits and other times, like last night, he looks like a goon looking for a fight. Here’s hoping that the Bruins can bring that energy level to Game 4 of this series. For the low-scoring Bruins to beat the Ryan Miller backed Sabres, they are going to need this kind of passion to get through the series. I didn’t get to go to the Winter Classic on January 1st, but the next day I did get to go to the Legends game. Bruins alumni and other celebrities well-known in Boston and beyond played in Black vs. Gold for charity. 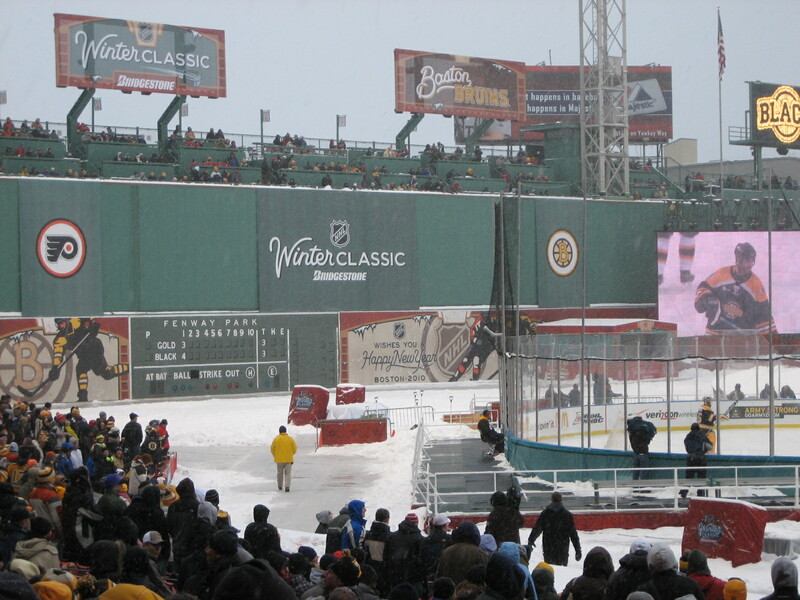 But for me, the game was secondary to the atmosphere – who knows when I’d ever get the chance to sit in Fenway seats looking at an ice rink while it is snowing. 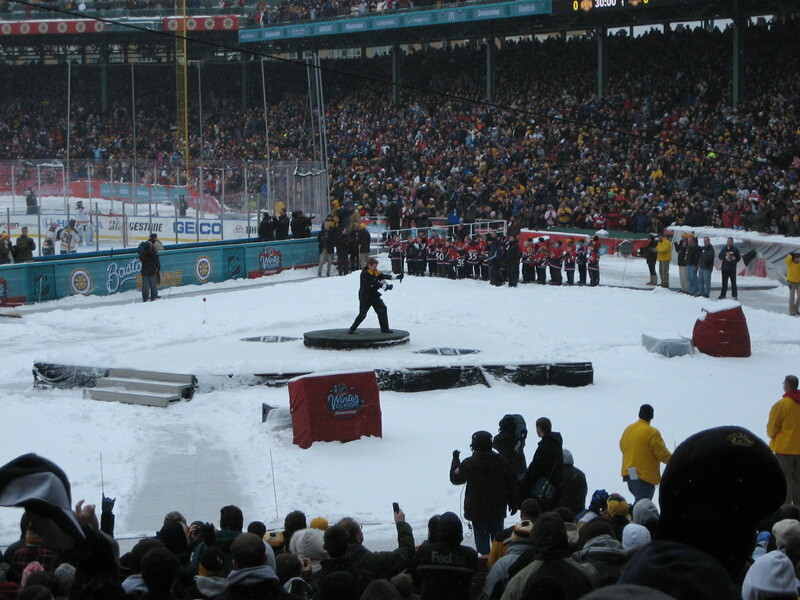 Here are pictures of Rene Rancourt doing his traditional fistpump after singing the anthem and of the Green Monster in hockey mode.